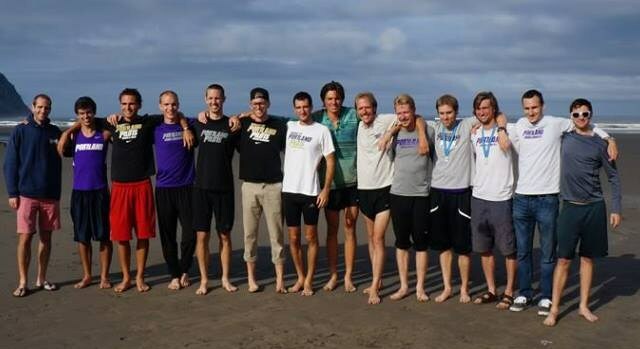 Team University of Portland Alumni finished this year's Hood to Coast Relay in a time of 18:59:59 to finish 2nd overall and 1st in the Men's Open Divison. There were over 1000 teams in this year's relay which began on August 23. Matthew Frerker, Tommy Betterbed, Scott Knackstedt, Michael Haugen, Scott Olberding, Robert Cosby, Dan Prahl, Kevin Zelenak, Rob Schlegel, Cody Barton, Michael Kilburg and Andy Edick are the only names I got. Congratulations guys.....it's good to know the old guy's have still got it! Nice! 5:40 average or so, I think. pilotram wrote: Nice! 5:40 average or so, I think. Close! Officially they ran the course in 5:46 minutes per mile. The winners completed the run in a pretty amazing 17:52 (5:25 mpm), and the third place team finished in a respectible 19:28.57 (5:55). After seeing the pictures in the story, I think you'll agree those guys need a couple of cheeseburgers and some beer! Yo dudes! I was on the team this year (3rd year, nbd) and although we're proud of how we ran, there was a giant clusteryourknowwhat that screwed us over and cost us two places. We were actually in a secure 2nd place and on track for a time of 18:30 (which would have been a 30 minute PB) until we hit a GIANT backlog at exchanges 23 and 24. It literally cost us an hour and a half waiting in line at both exchanges. A bunch of teams ended up jumping us as we found out later they switched the people in their vans (one team behind us even found out ahead about the backlog and had time to figure out a plan to get around it completely). Before we knew it, we were in 6th place playing catch up. We had a great time as usual, but were really upset that the race came down to (illegal) logistics and race official incompetence. Nevertheless, we plan on seeking vengeance next year. I've seen comments from various sources about the terrible tie-ups of runners and vans.....but I've yet to see anyone offer a solution. It would seem this is a race for ALL the people (even I participated one year at age 50), but with over 1,000 teams, has it gotten TOO BIG? Do the fun-run teams need to be separated from those teams that actually have a chance at a top-10 finish? Robcat, I love your pledge of revenge, but it would seem the sweetness of revenge will only result in disappointment unless race organizers smooth out the exchanges and allow the elite teams to actually compete on level terms.